There was a power and presence like a powerful magnet had his feet, and soul, under control. The energy that emitted from Kumano's small works (although his guinomi can be quite large) was quite intense, large and wonderful -- it was like the visitor had become a drunken madman just by being next to Kumano's work. Kumano sat across the room as the visitor told him this and Kumano said he was the only one who felt that. Surely that's not true, for how cannot a pottery lover be in awe of some of Kumano's creations. 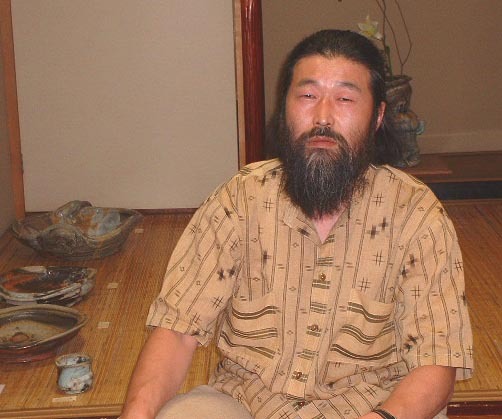 There has never been anything quite like Kumano's work in all of Japan's long ceramic history. The visitor went home that night only to find himself still unable to break free from Kumano's spell. He looked at Kumano's scary face on the cover of a Toh book and thought what a gentle spirit Kumano is. One of the most interesting photographs is just inside the cover. 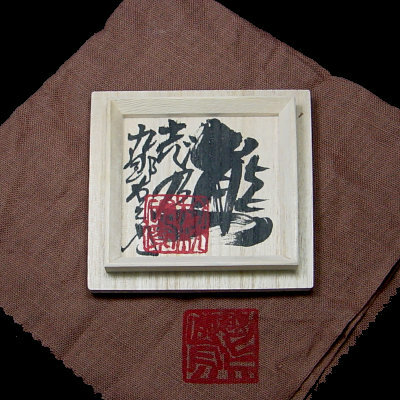 It shows Kumano, his face contorted and grimacing as he stokes his kiln with oak. The fire roars out of the kiln as if to bite Kumano -- the flame looking like the head of a lion as it swallows the oak log in a single gulp. That night the visitor had a dream. It was a dream of one of the guinomi he had seen that day and he knew that it was a sure sign that he must have it. He felt like he was going crazy! So, the next day he called the gallery and asked them to reserve the guinomi. The work had found him and not the other way around, he thought. 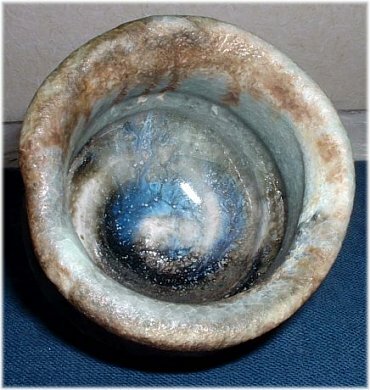 Below is the guinomi that made him almost lose his mind. 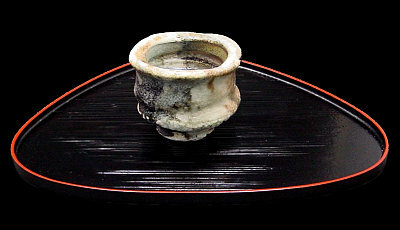 It has a fantastic shape where the grooves match the grip of a hand and it was fired in Kumano's low-sloping kiln at unbelievable temperatures. 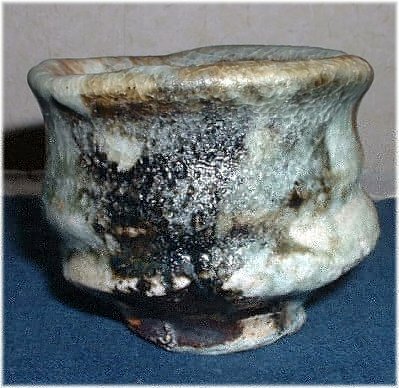 It has a black "cloud" drifting on the front next to a rich feldspar green glaze. The lip is slightly thick. On the back is a dark, mysterious iron oxide line that reminds him of a midnight forest. Inside is where he really lost himself though -- it is like staring into distant space or being inside an ancient cave like that of Chauvet Pont D'Arc. He knows of one Kumano collector who said he forgot about TV and the Internet for days after holding a Kumano guinomi. How does Kumano do it? Is he some magician? An alchemist? Or just a humble potter very much in tune with what he does? Kumano will have his 15th commemorative exhibition at Hankyu in Osaka from Oct. 2 to 8, 2002. 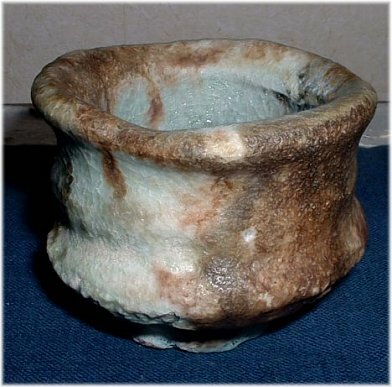 The catalog has some incredible guinomi, and other works such as his monster chawan that would surely cast a spell again. Osaka is too far for the visitor to go but then again he doesn't have to. He has the essence of his work in his grateful hands. If you have a chance to go to Osaka -- be careful of the magic that can appear at any moment, and from any Kumano piece that you get too close to. It's like a dream.